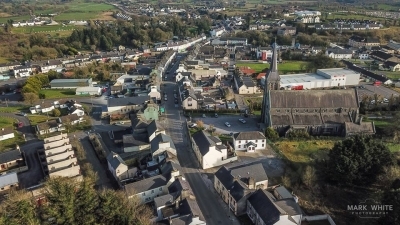 Ballyhaunis is the first town you come to in Mayo as you travel West, set among a patchwork of green fields, lakes, wildbog and beautiful country lanes. It is known as the "Gateway to Mayo" and is centrally positioned in the heart of Connaught, equidistant from the major urban centres, 10km from Knock Marian Shrine and 25km from Ireland West Airport Knock. Ballyhaunis has good transport links and is located on the intersection of the N60 and N83 and is served by the Dublin-Westport Rail link. There are daily bus connections to the four provinces, and Ireland West Airport Knock is within easy reach. The population of Ballyhaunis is in excess of 5,000 with an estimated 41 different nationalities represented in the town. The composition of the population is 65% Irish nationals and 35% Non-Irish nationals. Most of the employment in the town is provided by sizeable steel fabrication and food processing industries, supplying the Irish and overseas markets. There are also large numbers employed in construction, distribution, furniture manufacturing and ancillary construction service provision. The remainder of the employment base is spread between retail, government, financial and professional services. Ballyhaunis' central location has long made it an ideal centre of distribution for many businesses. Ballyhaunis is the home of Mid-West Radio and access to multi-channel television is provided by a community initiative, known as Ballyhaunis Community Television. Broadband access is now available from a variety of landline and satellite broadband providers. Ballyhaunis is the first town in Ireland to have a Multi-purpose Sports Facility which boasts the ability to facilitate different sports under the one roof, including soccer, basketball, volleyball, badminton, tennis and bocci. It was officially opened by Councilor John Cribben on 7th May 2010 and is very popular in the town and surrounding areas. In Ballyhaunis, community is very important, we have regular meetings to discuss the future of the town. We have an annual festival which brings hundreds of people to the town, an annual Pub Quiz spread through the whole town on one night. We recently held the 8K Road Race here which was very popular with runners from all over the country. At Christmas we have a visit from Santa who turns on the Christmas Lights and brings the community together, children and adults alike.